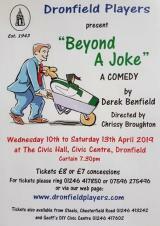 Dronfield Players present "Beyond a Joke"
Beyond a Joke is a comedy about four men and four women. Jane and Andrew's pleasant country house is accident prone. Six people have already died there in unfortunate and embarrassing accidents. When daughter Sally's young man Geoff arrives for the weekend unaware of the house's reputation, he mistakenly deduces from conversational confusion that the deaths were due to sinister circumstances. For tickets please call 01246 417850 or 07596 275496. Tickets are also available from Steels, Chesterfield Road and Geoff's DIY, Civic Centre. Fun film related activities and chat. Spaces are limited please book in advance. The festival features national performers, local celebrities, professionals, well-established names, as well as, those starting out in their careers. 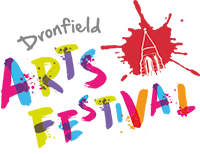 This is a unique celebration of the arts utilising some of Dronfield's best places and spaces delivered in partnership with several venues in the town including the Civic Hall. To book tickets please visit the website by clicking here.